ERIE, PA. — The Blue Steaks of John Carroll were ready to defend their CHMA playoff championship. The Lakers of Mercyhurst, playing on home ice as this year’s playoff hosts, were ready to play spoiler. But John Carroll hasn’t reached their expiration date yet. The game was evenly matched, as expected, during the first period, which was a scoreless affair. The only difference was John Carroll leading in shots, 9-6, and one minor penalty on each side. In the second, the Mercyhurst Lakers nearly broke the drought with a center ice dump-in goal midway through, but it was waived off due to an offsides call. They took advantage of a John Carroll penalty a few minutes later (the Laker’s third power play of the game) to take a 1-0 lead for real. At that point, it became a back and forth affair. John Carroll tied it, 1-1, with just over a minute to go in the second. The Lakers took the lead back midway through the third, but the Blue Streaks took advantage of a controversial Laker charging penalty to tie it once again on a goal by local Pittsburgh product Cullen McMahon (Chartiers Valley High School). 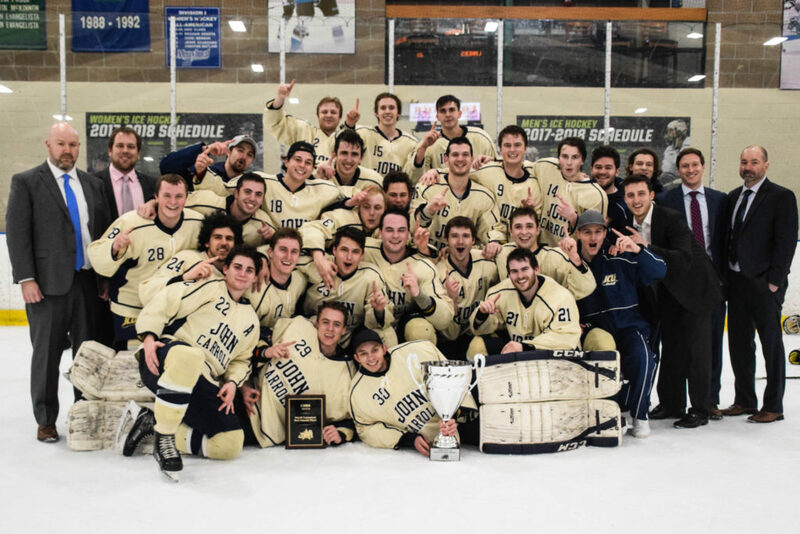 John Carroll added the game-winner with just under five minutes to go in the game and thus repeated as CHMA playoff champions.